Immediately after the Italian tour of early 1973, Phil Shulman left Gentle Giant, due to some serious personal differences and his concern over the strain that life on the road was putting on his family. He was also considerably older than the others. The group decided to continue as a five-piece outfit. Their first tour as a five-piece was also their second North American tour. It is believed to have run between March and May of 1973, although there are indications that it may have been originally planned to have started as early as Feb. 8 or 9. If so, Phil's departure may have been responsible for the delay. One March press notice had the tour ending by Apr. 22, but it was eventually extended beyond that. Shortly before leaving the band, Phil stated in the press that they had had some offers from promoters to do some headlining in America. However, the band was unsure of their footing there, so they decided to play it safe and continued to play mostly support for a while longer. On many of the dates on this tour, GG opened for Edgar Winter, Humble Pie, or the J. Geils Band. However, they appeared with other bands as well, in some cities. Confirmation is unfortunately lacking for many of these dates in both America and Canada. Some information comes from schedules published in Melody Maker and Billboard, but these two magazines were not in complete agreement. It would be reasonable to assume that dates were changed and shuffled around somewhat after the band made up their original schedule. Most of the dates after the Canadian leg of the tour come from a printed schedule in Gary Green's possession but there seem to have been some changes made to that schedule and, again, some of the dates are unconfirmed. 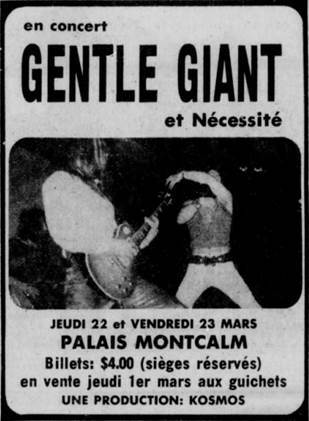 Hard information is still definitely lacking on some of Gentle Giant's activities in the spring of 1973. The Advent of Panurge - The recorder quartet began to include a rendition of Yankee Doodle, an addition which was commonplace during many future tours. Plain Truth - This may have only appeared in the band's longer headlining gigs and more often later in the tour. Mister Class and Quality?/Peel the Paint - This attempt at a THREE FRIENDS mini-medley may also have only appeared in the band's longer gigs and earlier in the tour. Still, this foreshadowed their later habit of combining songs, often from the same album, into medleys. Even though they had to rearrange their songs for one less member, their shows were still musically satisfying and generally well-accepted. Besides Knots and The Advent of Panurge, it seems no other OCTOPUS songs were played. Feb. 11 GG had appeared on an episode of the St. Louis, Missouri rock music television program Tube Trip at some point in the Fall of 1972, their very first North American TV showing. This is their second appearance on the same program and it is also the first appearance for which the exact date can be verified. They had been filmed on an unknown date and location during their Fall 1972 tour and both episodes probably aired the same film. 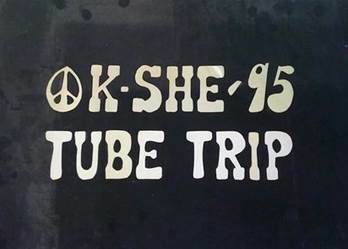 By the beginning of 1973, Tube Trip was being aired in both St. Louis and Kansas City, Missouri, eventually adding a station in Atlanta, Georgia briefly in the summer of 1973, before the program came to an end. As was generally the case with most episodes, this particular episode was advertised as airing first in Kansas City on the previous night of Feb. 10, but it was actually shown after midnight, in the early hours of Feb. 11. The actual St. Louis broadcast followed in the late evening of Feb. 11. Clips of the band playing live in a studio were probably shown, although that has not been verified. Also appearing on this episode were Osibisa and a band named Julia. In both cities, the TV broadcast was also simulcast over the radio. 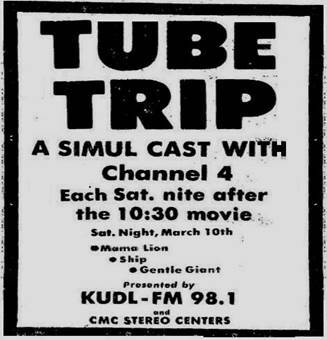 This film of Gentle Giant appeared on two other episodes of Tube Trip in the Spring of 1973, where it was combined with different acts. Feb. 23 Devizes, England Corn Exchange Evidence is mounting that this may have been Giant’s first outing as a five-piece band. However, this is not confirmed and conflicting evidence pinpoints the following Winchester listing as the first post-Phil Shulman gig. What is definitely confirmed from multiple sources is that Thin Lizzy did play in Devizes on Feb. 23, where their set was marred by violence between the audience and some members of the Hell’s Angels motorcycle gang. One fan in that audience kept meticulous notes on his concert experiences at the time and his still extant notes list Gentle Giant as the opening act. Gary himself, in a recent interview, recounted how the band opened once for Thin Lizzy in 1973 or 1974 in what he described as an unannounced “warmup gig”. That could certainly be an accurate description of this concert, as it did not appear on any publicized itinerary or as part of an organized tour. The only contrary information in Gary’s recollection is that he seems to remember the show in question being in the north of England, whereas Devizes is in the south. 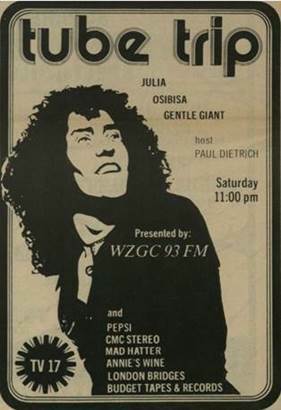 He also revealed that Thin Lizzy’s Phil Lynott was actually a fan of Giant. Mar. 4 Winchester, England King Alfred's College - John Stripe Theatre This show definitely did take place and it may, in fact, have been their first gig without Phil. During the band’s introduction, it was actually announced as such from the stage, as was the fact that Phil had gone back to teaching. Since King Alfred’s was a teacher education college, this comment elicited a few chuckles from the crowd. The show was held on a Sunday and could have been in late February, but it was probably on Mar. 4. They rehearsed for several hours in the theatre on the afternoon of the gig in order to work out the bugs in their new stage show. This was intended more or less as a tune-up gig before the start of their upcoming North American tour. The band did not even use their normal lighting personnel, instead hiring a student at the college to handle the lights. According to this person, the only lighting demand made was that no flashing lights at all were to be used. He also claims that all the lights went well, except for one small glitch at the beginning. The band entered the stage in darkness and the lights were supposed to snap on at the opening downbeat. Unfortunately, the lights came on early, spoiling the effect. The tickets, which went on sale the day before, were quite cheap, but there are conflicting reports as to whether the show sold out. Giant are said to have been pleased with the results of the show, as were the record company representatives in the audience. Two separate tapes of this concert once existed but sadly, both are now believed lost. 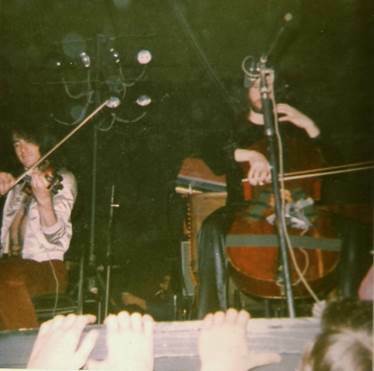 This concert was arranged by the same student friend of the Shulmans who arranged their Feb. 12, 1971 King Alfred’s show. Mar. 8 Hershey, Pennsylvania Hersheypark Arena The J. Geils Band and Edgar Winter both played here, although which band headlined is not clear. Giant served as the support act. Mar. 9 America It is not at all certain that GG performed in any concert on this night, even though they were advertised as appearing in both Nashville, Tennessee and Chicago, Illinois. An ad has been found, published on Mar. 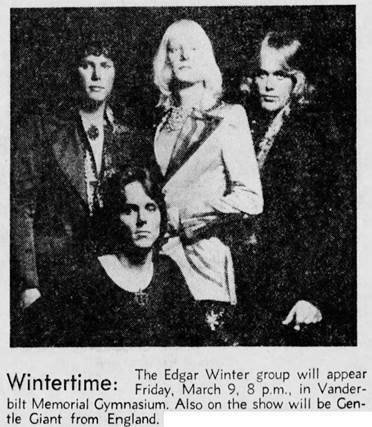 4, stating they were to open for Edgar Winter at the Memorial Gymnasium of Nashville’s Vanderbilt University. 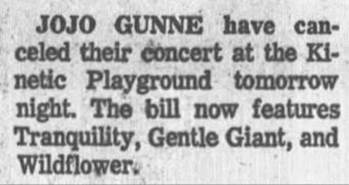 Then, just one day before showtime, the Chicago Tribune listed them as part of a bill at that city’s Kinetic Playground, along with Tranquility and Wildflower, possibly as a replacement for Jo Jo Gunne, who had just backed out. Right on Mar. 9, the newspaper still advertised this lineup, even though they also advertised Wildflower as beginning a three day run that very evening at a different Chicago venue. It is very unclear exactly what happened and more information is needed. Whatever the case, Giant did end up appearing at the Kinetic Playground on April 13, as listed below, where they supported Procol Harum. Mar. 10 Louisville, Kentucky Convention Center Giant and Jo Jo Gunne both opened for Edgar Winter. A tape of the show exists. Mar. 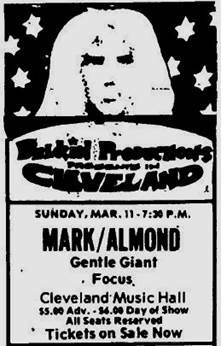 11 Cleveland, Ohio Music Hall shared the bill with Mark-Almond and Focus, although the order of the concert is not at all clear. Printed ads even disagree as to who headlined, although it definitely was not Giant. Mar. 11 Giant appeared on another episode of the Tube Trip television show, this time sharing air time with Mama Lion and Ship. It was first aired in Kansas City in the early morning hours, then in St. Louis later in the evening. It was also simulcast over the radio in both cities. Mar. 12 Youngstown, Ohio State Theater There are said to have been four acts on the bill this evening, beginning with a male dancer, then a gospel group and finally Giant and headliners Focus. It’s fairly certain this older venue was named the State Theater at the time of this gig, but it was also known as the Tomorrow Club or the Agora at other times in its existence. This was supposedly the first rock concert held there. Mar. 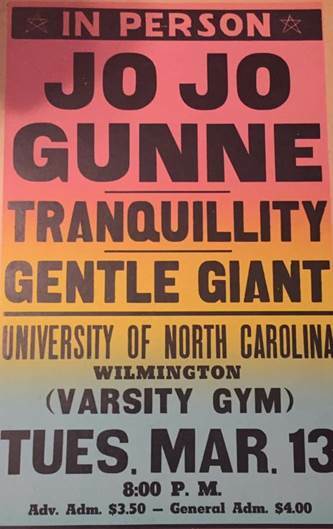 13 Wilmington, North Carolina University of North Carolina opened for Tranquility and headliners Jo Jo Gunne. In the Univ. of North Carolina college newspaper The Seahawk, a review was kind to Giant but heaped the most praise on Tranquility. Mar. 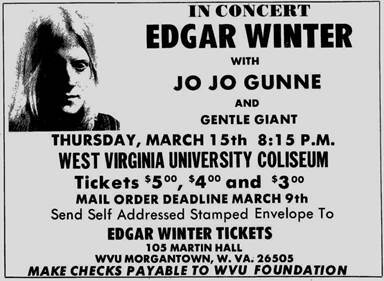 15 Morgantown, West Virginia West Virginia University - Coliseum The band was scheduled to open this triple bill, to be followed by Jo Jo Gunne and headliner Edgar Winter in the university's gymnasium, After the audience had arrived, it was announced that the full bill would not appear. Unfortunately, it’s not known whether it was Winter or Jo Jo Gunne or both who canceled. Whatever the case, it appears that Giant agreed to play and even extend their performance. The majority of the crowd left, but those who stayed witnessed an unusually long Giant set. Although not confirmed, a fan at the show is sure they played all the songs from OCTOPUS during the course of the evening and specifically recalls the band doing a fine job on River. It seems unlikely that both bigger acts canceled while only the opener actually performed, but one person in attendance remembers it that way. More information is needed about this concert. Mar. 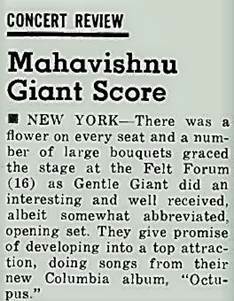 16 New York, New York Felt Forum Cash Box reported that there was a standing room only crowd in attendance on this night to see Giant open for the Mahavishnu Orchestra. As fans of the headliners, the members of Giant were very much looking forward to this gig, but were disappointed in Mahavishnu's performance. Ray, who was jumping around a lot and even rolling on the stage, supposedly split his pants during Giant's set. A partial tape exists of Giant’s performance, while a complete tape recorded by a different person in the crowd is now missing. Originally, Giant was booked on this date to play a gig with Grin, Foghat and Edgar Winter in the gym at West Chester University in West Chester, Pennsylvania. However, they canceled out of that show and ended up playing at the Felt Forum, instead. A touch of class was brought into the festivities as a row of white carnations lined the front row of the orchestra seats. Singer/songwriter James Taylor was in the crowd and, since it was Mahavishnu violinist Jerry Goodman’s birthday, Taylor brought a birthday cake on stage during the headliners’ set. There is one vague report, not corroborated elsewhere, that Giant was slated to open for Mahavishnu at one other unknown time, but canceled their appearance. Mar. 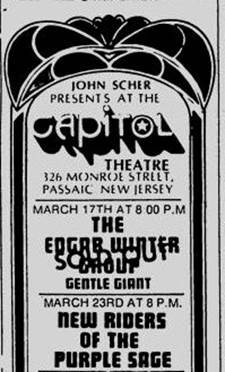 17 Passaic, New Jersey Capitol Theater opened for Edgar Winter. The show was sold out in advance. 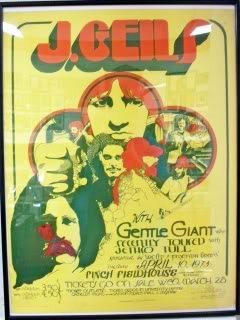 Curiously, a review in the Herald-News stated that the members of Gentle Giant were all classical musicians who, upon realizing they were unable to make a living playing the classics, had just recently switched to rock music. Mar. 18 Allentown, Pennsylvania Allentown Fairgrounds - Agricultural Hall At this show, the first of the year sponsored by the Allentown Council of Youth, GG played before Foghat and headliner Edgar Winter. The show was sold out with 5,500 fans present. For much of the year, concerts at these Fairgrounds were held outdoors in the grandstand but, being scheduled at the tail end of winter, this one was held at the indoor Agricultural Hall facility. The Hall was cramped and more than one critic complained about the heat, smoke, poor ventilation, and uncomfortable seating on the concrete floor. An existing tape shows that portions of the crowd were quite rambunctious throughout the evening. At one point, many fans were unable to see and were yelling loudly, prompting Derek to ask, from the stage, for a return to order. Mar. 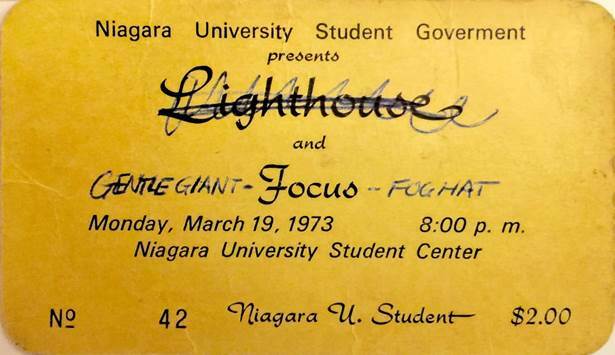 19 Niagara Falls, New York Niagara University - Student Center Giant played second, after Foghat and before Focus. the Student Center may actually have been a gymnasium. Giant’s appearance at this gig was as a last minute replacement for another band who canceled. They again were afforded headlining status in Canada, with their appearances there once again extremely well-received. In fact, Giant continued to be a major draw in Canada throughout their career. 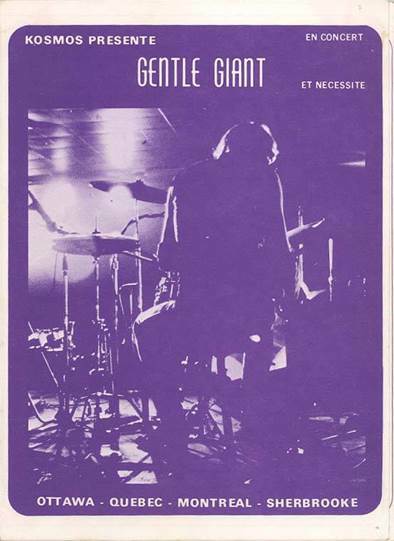 The credit for initially breaking the band there goes to Kosmos Productions and promoter Alain Simard, who booked the original 1972-1973 GG concerts in eastern Canada, mainly in cities all over Quebec Province. Simard was also a journalist who wrote many articles in Pop-Rock Magazine at the time touting the band’s virtues. There has been very much confusion as to the exact dates and venues of the Canadian shows. Melody Maker mentioned there were nine concerts scheduled for Canada, but a schedule printed in Billboard only listed six. Personal recollections from fans in attendance at the shows at times differ from the information in either of these sources. However, the dates listed below, particularly those in Quebec Province, seem to be fairly reliable. Mar. 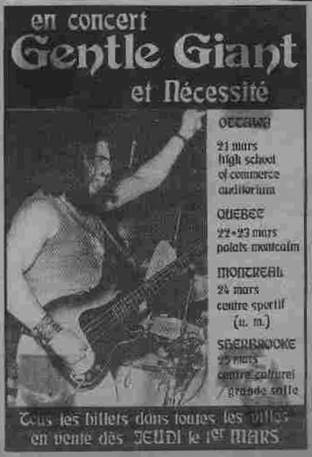 21 Ottawa, Ontario High School of Commerce - Auditorium The Quebec area prog act named Necessite was the opening act. According to two newspaper accounts, the attendance was 600. This is not to be interpreted as poor attendance as it was a relatively small auditorium. The reviewer for the Ottawa Citizen was impressed with the band’s music and noted they were very well received, but criticized the “overacting” on stage and the overly loud volume in such a small venue. A couple other interesting occurrences were pointed out in this same review. At one point, John’s drum solo was panned rapidly back and forth between the stacks of speakers on the left and right sides of the stage. More significantly, the group came out for a brief encore, most likely The Queen, during which they played a snippet of the Canadian National Anthem. This is the only confirmed occasion after mid 1972 when they played a country’s National Anthem at the end of a gig. It may have happened at other times but appears on no other recordings from this time period. It seems that the band was interviewed on this day, as an interview was broadcast over an Ottawa college radio station just five days later, on March 26. Mar. 22 Quebec City, Quebec Palais Montcalm Tapes exist of what are believed to be both of the scheduled Quebec City shows, though one of them is often mistakenly attributed to Montreal. A humorous moment happened on one of the tapes when, towards the beginning of Knots, Kerry's keyboard broke down, forcing one of the band members to whistle the missing part. However, it is not clear which tape is which, so it's unknown which night this happened. Also, neither tape is complete, although GG headlined the shows. Necessite was the opening act both nights. John has said that, when first taking the stage in Quebec City, he had no idea the group was as popular as it was there. Upon hearing the applause, he turned around to see if the crowd was clapping for someone behind him. Le Soleil gave the band a nice review but was critical of the conditions in the venue. Mar. 23 Quebec City, Quebec Palais Montcalm As stated above, a partial tape of this gig exists and Necessite opened the show. It’s known that at least one of the twp Quebec City shows was sold out, but which one is not known. Mar. 24 Montreal, Quebec Centre Sportif de l'Universite de Montreal Necessite was again the opening act. Local press reports differ as to attendance, ranging from a full house of around 5,000 down to only 2,000. There has been considerable speculation and debate concerning fan memories of this particular gig. Several in attendance swear that a real-life giant was used to introduce GG at this show, with more attendees coming forth to support this claim all the time. Other fans adamantly deny such an odd thing ever happened. Fortunately, promoter Alain Simard has recently confirmed what actually happened. There was indeed a bearded Gentle Giant look-alike who came on stage to introduce the band. His name was Jean Sarault, a gentleman who sometimes worked with openers Necessite, a group managed by Simard. Although not technically a giant, he was tall and weighed close to 300 pounds. He was dressed in medieval clothing borrowed from the 1973 theatrical production of The Castle of Light which was produced by Simard and used Necessite’s music. During his introduction, Sarault had a dove perched on his finger, again borrowed from Necessite who were known to occasionally use a live dove during their set. This unusual introduction was a one time event, as members of GG have repeatedly denied such a gimmick was a regular part of their concerts. A review of this show in the Montreal Herald mentioned nothing unusual. This same review did, however, give GG a scathing review, calling their music “pure trash” and offering up the high quality of the sound system as the only positive aspect of the performance. A complete tape exists of Giant's set on this night, the only known complete tape from the band's Canadian headlining gigs from March 1973. During his vibraphone solo in Funny Ways, Kerry quotes a bit of the folk song, Joshua Fought the Battle of Jericho. This was a general admission concert with no assigned seating and, prior to the show, venue employees had to board up the window near the front entrance with plywood so as to stop fans from breaking through the glass. Paper flyers were handed out at the doors and, once inside the hall, huge numbers of impatient fans made paper airplanes out of these flyers while waiting for the show to begin. Mar. 25 Sherbrooke, Quebec Centre Culturel - Grande Salle Necessite was once again the opening act. Mar. 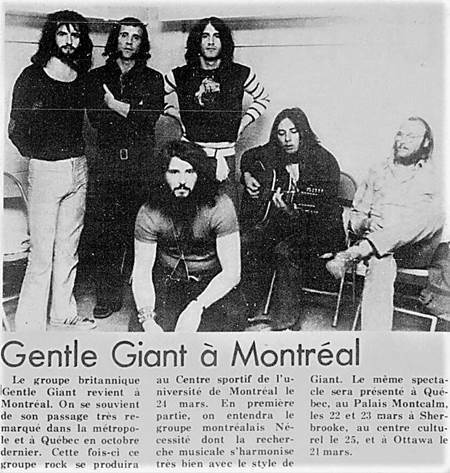 26 In Ottawa, Canada, Carleton University’s CKCU-FM radio station broadcast a pre-recorded half hour interview with members of Gentle Giant. Chances are it was recorded when the band visited that city on March 21. Mar. 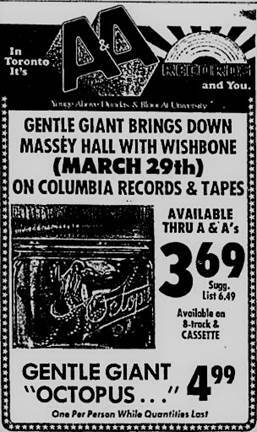 29 Toronto, Ontario Massey Hall Headliners Wishbone Ash had sound problems on this, the opening day of their North American tour. As openers, Vinegar Joe played first, followed by GG. Of the three bands, Giant was the only one to receive a favorable write-up in a Toronto Star review bearing the headline "Patience of Audience Tested at Rock Show." Attendance at this sold out four hour show was at least 1,600. Toronto was another city that Ray thought had a very open, adventurous musical heritage. 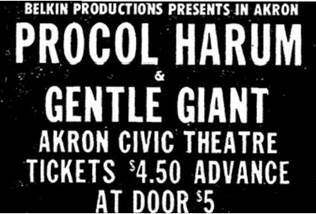 Early on, it was advertised that GG would be opening for Edgar Winter at the Masonic Auditorium in Detroit on this evening, the first of two consecutive Detroit gigs for Winter, but Giant did not play. Mar. 30 Detroit, Michigan Masonic Auditorium Although GG did not appear in Detroit with Edgar Winter on the previous night, they did open for Winter on this night. Confusingly, one fan recalls the band actually playing another Toronto show, supposedly a general admission show at a local university, on the night after the above listed Massey Hall concert which would place it on Mar. 30. However, confirmation about this alleged second Toronto gig has never been found. Detroit on March 30 seems definite. Mar. 31 Waterloo, Ontario Waterloo Lutheran University Posters and newspaper ads show that two sets were planned originally on this date, starting at 7:00 and 10:00 P.M. However, although not confirmed, it seems likely that only one performance took place. It was held in the University's gym which had a proper stage set up on one end and could hold around 1,200. The concert was sold out. 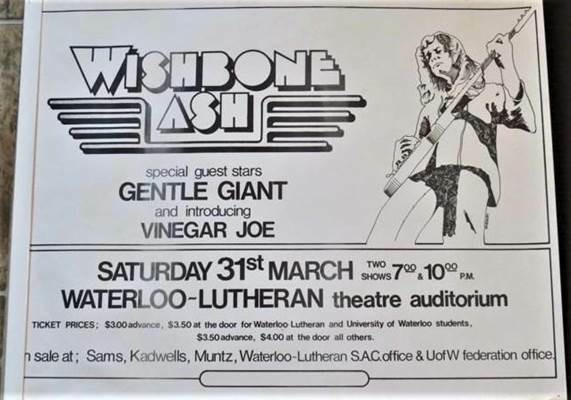 Giant opened for Wishbone Ash and was preceded by Vinegar Joe. Billboard stated the band was scheduled to play in Buffalo, New York on this night, while another early published ad had GG opening for Quicksilver Messenger Service at New York City’s Academy of Music on this very same night, but Giant did indeed end up in Waterloo instead. but they actually played in Waterloo. In fact, Giant received a standing ovation from the crowd, rare indeed for an opening act. The audience seemed particularly enthralled by Ray’s violin solo, during which he plucked quite hard on his strings, no doubt a bit of planned theatrics. One report had him actually breaking all four strings, one at a time, although this seems very unlikely and is disputed by another fan report. Although Giant did well this evening, Wishbone Ash had to endure equipment difficulties at the beginning of their set. To top it off, after the show, the crowd had to drive home in freezing rain. Unfortunately, University officials were quite unhappy with the mess left behind by the crowd and by their general behavior which, on this night, required a police presence to restore order at one point. The large percentage of younger, rowdy high school students was blamed for this overall poor behavior. ??? Buffalo, New York New Century Theatre Although erroneously listed in Billboard as taking place on March 31, sources indicate the band did indeed play in Buffalo somewhere around this time period. This is not confirmed, but these sources also recall no one else being on the bill. They did play in nearby Niagara Falls on Mar. 19, but there were others on that bill, so this may be a totally different show. Apr. 3 Fort Wayne, Indiana Lantern another gig which may have been added at the last minute. A tape exists of this show at which Fort Wayne’s very own prog band, Ethos Ardour, was the opening act. During Plain Truth, the power went out four separate times. At first, the band was not thrown too badly by this with John managing to keep an exciting beat and Derek even singing some of the instrumental parts. However, after the fourth time, the band began to leave the stage in frustration, only to be coerced back by their manager. About 1,100 people were estimated to be in attendance. Apr. 5 Macomb, Illinois Western Illinois University opened for Humble Pie before a near capacity crowd. 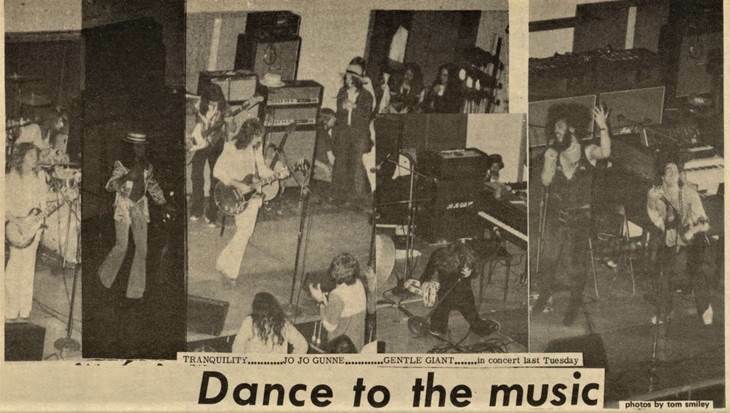 The student newspaper Western Courier gave both acts high marks, stating that GG provided the listening portion of the evening while Humble Pie provided the boogying portion. Apr. 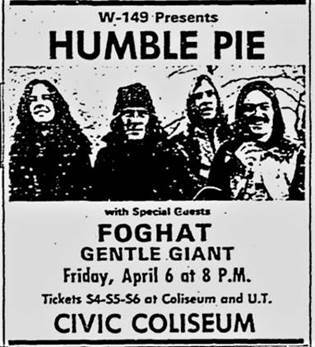 6 Knoxville, Tennessee Civic Coliseum The band was scheduled to follow Foghat and precede Humble Pie, though a fan at the gig doesn't recall Giant actually appearing. 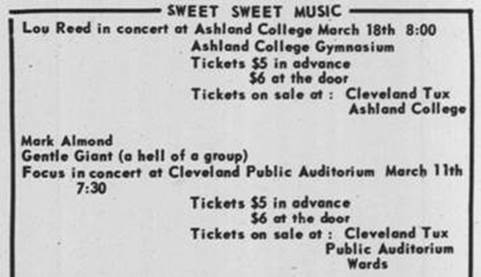 Confusingly, another report has this same three band bill appearing on this very same night at Indiana State University in Terre Haute, Indiana. Apr. 7 Roanoke, Virginia Roanoke Civic Center opened for Foghat and headliners Humble Pie. Giant’s name did not appear in all the pre-concert advertising, nor was it on the tickets, so some in the audience loudly voiced their disappointment at having an unexpected band delay the appearance of the other bands. 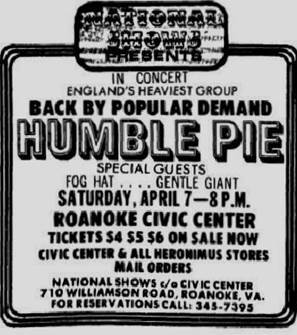 One fan seems to recall another date in Roanoke around 1973 or 1974 when Giant opened for southern rockers, the Marshall Tucker Band but this is not confirmed. 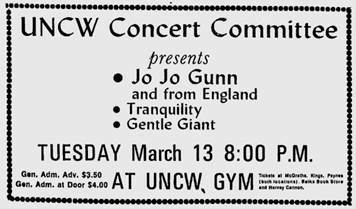 Likewise, there is also an unsubstantiated report that Giant played a gig in the mid-1970’s opening for Jo Jo Gunne, somewhere in the Roanoke or Salem, Virginia area, but this too is unconfirmed. Apr. 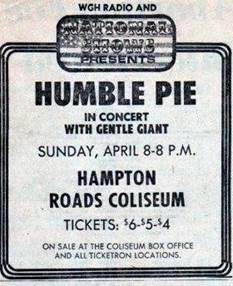 8 Hampton, Virginia Hampton Roads Coliseum Followed Foghat and preceded Humble Pie. The audience drawn to this show for the other two boogie/hard rock acts was understandably perplexed when Giant started their set. However, they reportedly came around and, by the end, they were quite appreciative. There had been a rumor that Uriah Heep was also on the bill, but this was not the case. In its review, the Newport News Daily Press mentioned nothing about the music, but pointed out that 30 people were arrested for marijuana possession. A recording of GG’s half hour set is rumored to exist. Apr. 8 Giant appeared on yet another episode of the Tube Trip television program in St. Louis and Kansas City, Missouri, simulcast over local radio in both cities. The Kansas City broadcast came first, in the early morning hours, while in St. Louis, it was shown later in the evening. Also appearing on this episode were Black Oak Arkansas, White Bird and Peter Allen. Apr. 10 Mt. Pleasant, Michigan Central Michigan University - Finch Fieldhouse It’s been confirmed by three fans at the show, a University official, an existing poster, a pre-concert newspaper ad and a published review that GG opened for the J. Geils Band here on April 10 in front of an audience of 4,000. However, this audience’s reaction to Giant is not as easy to pin down. One fan claims much of the crowd ignored Giant’s set, only coming around at the end, while a published review of the show states that the crowd was quite appreciative and gave GG a standing ovation. It turned out to be quite a dramatic evening. Just as the concert was beginning, a fire broke out in a locker room and Finch Fieldhouse, an old basketball facility, had to be completely evacuated. Unfortunately, the crowd’s reentry was somewhat chaotic making it easy for those without tickets to walk in with the throng, leaving some paid ticketholders without seats. Apr. 11 Johnstown, Pennsylvania Cambria County War Memorial Although this has proven to be a confusing date, it seems most likely that GG opened in Johnstown for Humble Pie. Foghat was again supposed to precede Humble Pie, but they bowed out and did not appear. Giant was either an unadvertised first act on the bill, or a last minute substitute. 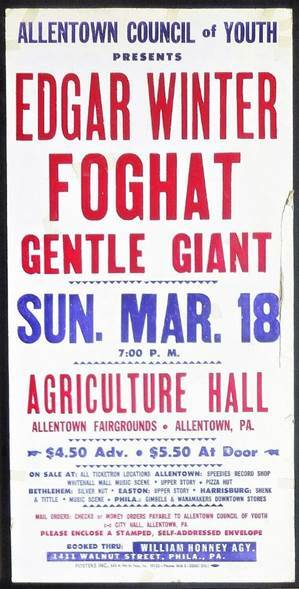 Either way, many in the crowd were not aware Giant was on the bill and, expecting Foghat, were slow to accept them. However, the recorder quartet in The Advent of Panurge is said to have brought the audience around. The War Memorial was basically a minor league hockey facility seating about 5000, though there’s no information on the size of the crowd this night. The initial confusion came from the fact that other sources pointed to GG opening for the J. Geils Band on this date at the Masonic Auditorium in Detroit. However, that does not seem to be the case, although it may have been planned at one point. Of course, GG had already played Detroit on March 30. Apr. 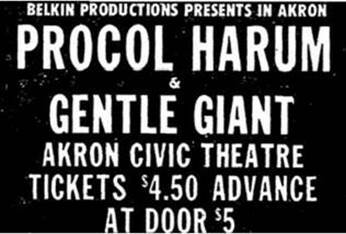 12 Akron, Ohio Civic Theater opened for Procol Harum. Meanwhile, in Oklahoma City, the Apr. 12 issue of The Oklahoman printed an article claiming GG would be opening this very evening for Yes at the State Fair Arena, which they did not do. 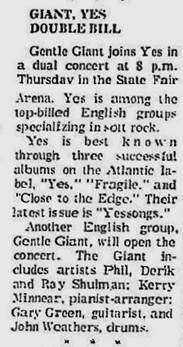 On the same page, they also printed a display ad for the Yes show which included the correct opener, the band Trapeze. The Yes/Gentle Giant double bill may have been planned at one point, but how such an odd journalistic gaffe came about is unclear. Apr. 13 Chicago, Illinois Kinetic Playground Only about 200 people were in the crowd on this night to see Giant play in support of Procol Harum. GG supposedly put on a problem-free show, but Procol's set was bogged down by a myriad of technical problems. One person in attendance seems to recall Giant playing a new song that they introduced as "not being on an album yet." He says they then played Proclamation. This cannot be verified, but that song is not believed to have been played regularly on stage for another nineteen months. Ray later recalled this concert with great fondness. Apr. 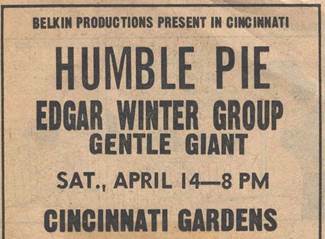 14 Cincinnati, Ohio Cincinnati Gardens It had been advertised that the band was to play at the Holheinz Pavilion in Houston, Texas on this night, but they actually played in Cincinnati, where they opened for Edgar Winter and, in the headliner slot, Humble Pie. Apr. 15 Baltimore, Maryland Civic Center A fan recalls GG playing a 30-minute set opening for Edgar Winter and headliners Humble Pie. 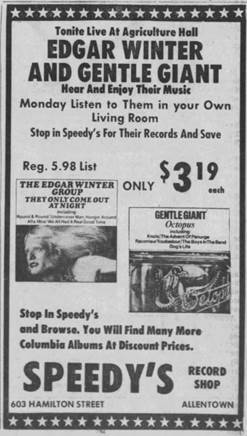 However, this is questionable as ads in the Baltimore Sun consistently listed Spooky Tooth as the intended opener. Sadly, a lengthy review afterwards gave no mention of the opener. Apr. 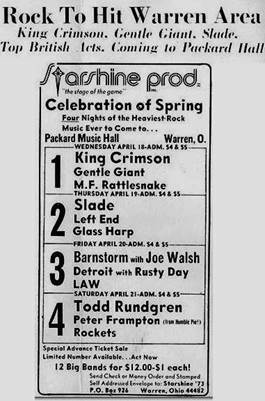 18 Warren, Ohio Packard Music Hall This is the first known date of a mini-tour that Giant did in the Midwest playing support for King Crimson. On this particular occasion, a local Warren band named MF Rattlesnake performed first, before Giant and Crimson. Gary's schedule lists a show in Cleveland, Ohio on this date but it may simply refer to this gig, since Warren is near to Cleveland. The band's airline itinerary saw them flying into Cleveland on Apr. 16, but staying right in Warren until Apr. 18. Some band members recall their rather long layover in Warren as being quite boring, as they had little to do there. They finally returned to stay in Cleveland for one night on Apr. 19. Apr. 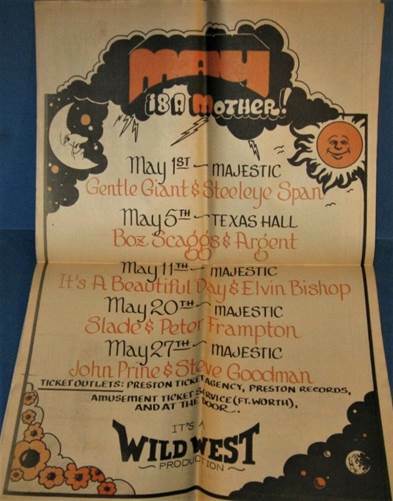 20 San Francisco, California Winterland Giant’s appearance at this gig was canceled. They were scheduled to play second on the bill, after Colin Blunstone and before Commander Cody and The Lost Planet Airmen and headliners Sha-Na-Na. 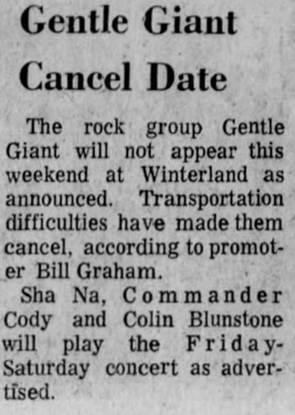 However, promoter Bill Graham announced that they “transportation difficulties” necessitated them dropping out of this and the following night’s Winterland shows. Apr. 21 San Francisco, California Winterland Giant’s appearance at this gig was also canceled, like the night before, because of transportation difficulties. The order of the bill was again supposed to be Colin Blunstone, Gentle Giant, Commander Cody and the Lost Planet Airmen and headliners Sha-Na-Na. Gary's schedule lists the band as originally intending to play San Francisco on Apr. 19, but this may have been changed. There is an unconfirmed report that Giant was replaced on the bill by Steeleye Span on this evening. Apr. 22 Kansas City, Missouri Cowtown Ballroom another night opening for King Crimson, with jazz saxophonist Charles Lloyd taking the stage first. It’s been hypothesized that Lloyd’s guitar player may have been having problems on this night. 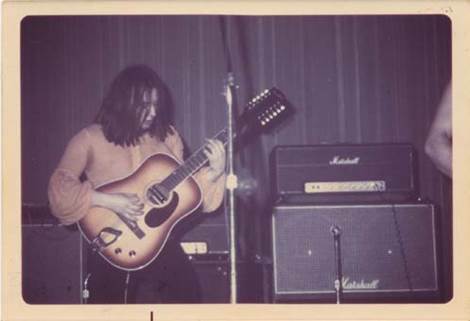 According to an audience report, this guitarist, after a solo, “sat on his amp, put his head in his hands and cried like a baby.” The Cowtown Ballroom was a small, intimate venue which only held about 800 people. There were no seats, just an old hardwood floor from when the place was previously a roller skating rink. Still, the hall had excellent acoustics. As was the case at the Mar. 15 Morgantown show, a fan in attendance at this show clearly remembers the band playing River. However, no recorded evidence that this song was ever performed live has turned up and, for his part, John Weathers has claimed that the band never did play it live. At this gig, John and Gary watched a little of Crimson’s set but were not all that impressed, thinking it a bit pretentious at times. On the other hand, the members of GG felt their music had won over the crowd and, several years later, commented about this successful gig at the Cowtown and the fond memories associated with it. 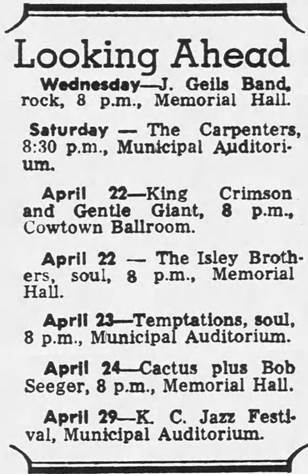 Giant’s original plans at the beginning of the year had April 22 being the last date of their North American tour, though that obviously changed. Surprisingly, Richard and Karen Carpenter of the American pop sensation, the Carpenters, were spotted in the audience during Crimson’s set, although it’s not known if they were there earlier in the evening. Apr. 23 Wichita, Kansas Henry Levitt Arena opened for King Crimson. An ad in Billboard listed the venue as the Century II Arena, but most sources say the show was held at the Henry Levitt Arena. Apr. 24 Oklahoma City, Oklahoma State Fairgrounds - International Building again opened for King Crimson. 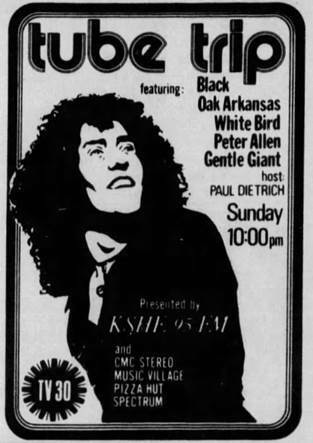 Ads in Billboard and Rolling Stone listed a show planned on this date at the Red Dog Inn in Lawrence, Kansas, but it was apparently changed eventually to Oklahoma City. The gig was definitely not sold out. Apr. 25 Salt Lake City, Utah Terrace Ballroom Giant opened for the J. Geils Band. Apr. 26 Portland, Oregon Paramount Theatre opened for Sha-Na-Na. A couple published sources mistakenly advertised Giant’s appearance here and in Seattle the following night as being in the opposite order, but Giant did play Portland on Apr. 26. Apr. 27 Seattle, Washington Paramount Northwest Theatre again opened for Sha-Na-Na. Supposedly, portions of the crowd were pretty receptive towards Giant, while others were quite rude, yelling out for Sha-Na-Na during some of the songs. Being an opening act, GG played no encore on this night, ending with Plain Truth, after which many in attendance did give them a standing ovation. One person at the show has said that many Giant fans left before Sha-Na-Na even took the stage, but another recalls the theatre remaining quite full during the headliners’ set. As noted in the above listing, this and the Portland show were sometimes advertised in reverse, by mistake. Apr. 28 Long Beach, California Long Beach Arena A show at the Long Beach Arena was advertised at the time, but no corroboration has been found and Gary claims it was canceled and did not take place. There was also a rumor that the group played in Ontario, California on Apr. 28, but that stems from a misreading of the plane schedule which had them actually flying into the city of Ontario on Apr. 28 before checking into their hotel in San Bernardino, where they did perform the next night. All three cities are very near each other. Apr. 29 San Bernardino, California Swing Auditorium The group headlined this show. ??? San Antonio, Texas Municipal Auditorium It is not clear if this show ever took place. Billboard originally advertised the date as April 13, but it’s certain they played Chicago on that night. A gig in San Antonio may or may not have been rescheduled. May 1 Dallas, Texas Majestic Theater Steeleye Span was the opening act at this old style movie theater. John was apparently not feeling well on this night but is said to have played well, nonetheless. This was a poorly attended show, with one report claiming only 32 people to be in attendance. 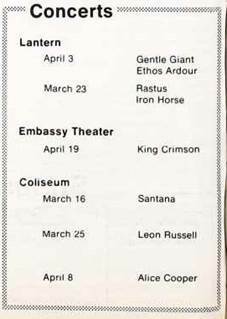 An earlier date of March 15 at the Memorial Auditorium in Dallas had at one time been advertised. 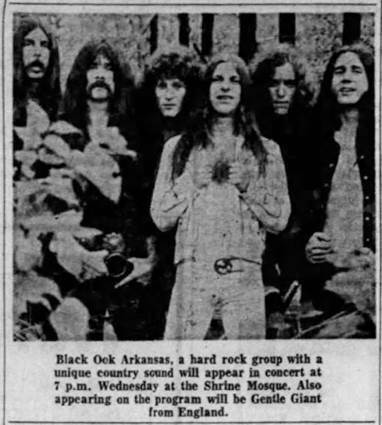 May 2 Springfield, Missouri Shrine Mosque opened for Black Oak Arkansas. During BOA’s set, someone began flicking the house lights on and off. A large fight broke out with audience members and even road crew involved. Fire Marshals had to be brought in to clear the aisles and restore order before the concert could continue. May 3 Little Rock, Arkansas Barton Coliseum opened for Ten Years After. Actor Billy Bob Thornton was at this show, and he recollects GG playing first, with the Strawbs taking the stage second and, finally, Ten Years After. An alternate rumor has Patto appearing on the bill. It's not known if GG ever played Little Rock again after this, as they were reportedly not terribly popular there. May 4 Austin, Texas Armadillo World Headquarters Steeleye Span opened. There is also a report that a Los Angeles show may have been originally planned for May 4. May 5 San Francisco, California Winterland Steely Dan, Humble Pie and Slade all played the Winterland here this evening. GG is said to have also been on the bill, but that is totally unconfirmed. 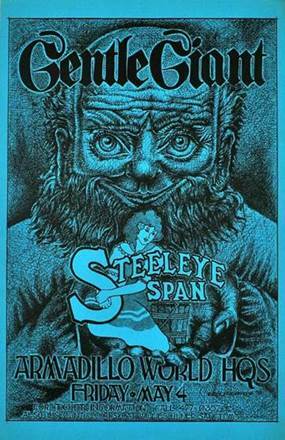 May 6 Houston, Texas Santa Rosa Theater Steeleye Span was the opening band. ??? Miami, Florida Hollywood Sportatorium Clearly, pinning down Giant’s exact activities in early 1973 continues to be problematic. One uncorroborated online source claimed GG played a 1973 Miami gig opening for the band Chicago. Rolling Stone did place Chicago at a Miami gig on May 25, but that seems way too late for GG to have participated. Mid 1973 was a difficult time for Gentle Giant as they struggled to make their first album without Phil Shulman. His creative contribution to the earlier albums was immense but the band's musical style did continue to evolve even after his leaving. John Weathers began to contribute more of what would become his trademark straight ahead drumming style. This made for a more concise, solid sound. June ? 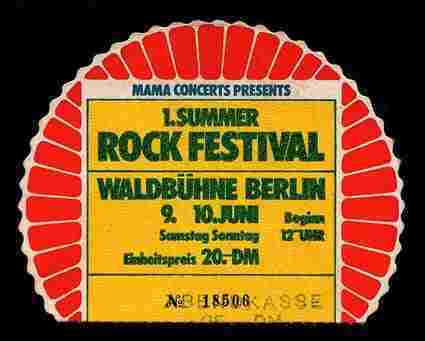 Berlin, Germany Waldbuhne Giant was booked to participate in this, the first of Germany’s 1973 "Summer Rock Festivals". 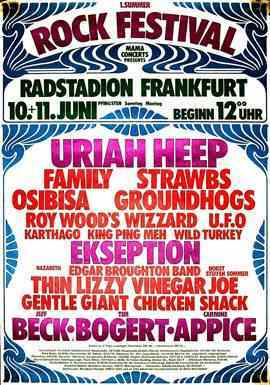 This was a three day-day rock event split between the cities of Berlin and Frankfurt that also included, among others performers, the Strawbs, Family, Ekseption, Beck-Bogart-Appice, and Uriah Heep. Attendance in Berlin was a disappointing 6,500, much lower than the size of the crowd in Frankfurt. The portion in Berlin was on June 9 and June 10, although it's not known which day Giant was scheduled to perform. Unfortunately, several eyewitness accounts have surfaced which cast doubt on whether Giant appeared at all. June ? 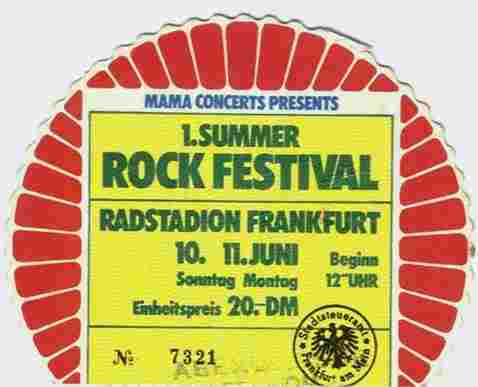 Frankfurt, Germany Radstadion another stop on Germany's first "Summer Rock Festival" with the same basic lineup as at the Berlin show. The festival stopped in Frankfurt on June 10 and June 11, overlapping the Berlin show. A much better crowd, totaling 24,000, showed up in Frankfurt, than went to Berlin. The German press reported as many as 10,000 attendees lined up for up to three hours before the festivities even began. In both cities, organizers tried to cut eliminate wasted down time by showing Marx Brothers films between each act. At the end of the final evening in Frankfurt, a large fireworks display celebrated the conclusion of the Festival. Again, it's not known on which night GG was scheduled to play, but one recent report indicates the band may have canceled their appearance, as was also the case at the Berlin stop listed above. July ? 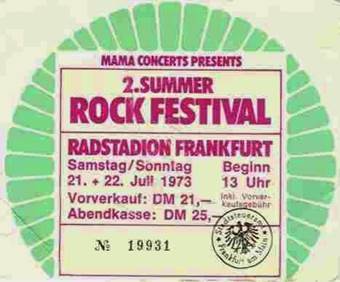 Frankfurt, Germany Radstadion This was Germany's second 1973 "Summer Rock Festival". Unlike the first such Festival held the month before, this one was only staged in Frankfurt, probably due to the low attendance figures in Berlin back in June. Giant again participated, along with a number of other bands, including Black Sabbath, the Faces, Sly and the Family Stone, Rory Gallagher and Canned Heat. At one time, Paul McCartney and Wings were being advertised as the headliner, but that did not happen. The show took place on the weekend of July 21 and 22, but it is not known on which date Giant played. 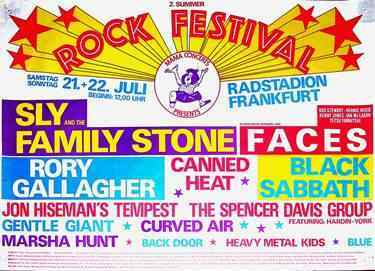 The U.S. Armed Forces, with a heavy presence in Germany at the time, is said to have been very unhappy with all the rock festivals held in that country, as they believed they drew too many soldiers away from their regular duties. July ? 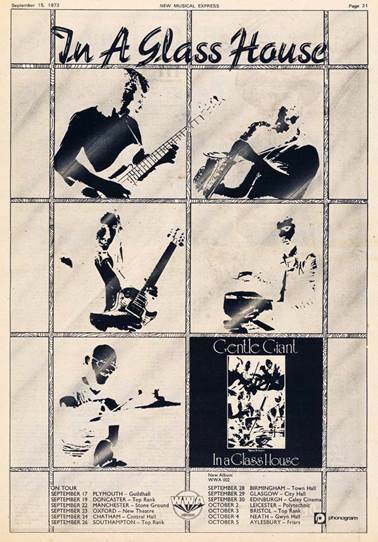 After the aborted attempt at recording during the previous December and January, IN A GLASS HOUSE, Gentle Giant's fifth album, was finally recorded at Advision Studios in London. Before leaving the group, Phil had stated that initial talks centered around making this album either a live release, or some sort of a concept album. As it turned out, it was neither. Derek claimed that very little music had actually been written beforehand, forcing the band to come up with their ideas quickly while in the studio. The album was recorded during a time of stress for the band, being the first one not to include the elder Shulman. The band had mixed feelings concerning the music on the album but, on an emotional level, they have very poor memories of the recording sessions. Aug. 28 At London's Langham Studio 1, the band did their seventh BBC studio session, broadcast on Sept. 28. The songs recorded were Way of Life, The Advent of Panurge and The Runaway. This was GG's third BBC session in a row to include The Advent of Panurge, which would appear again in the next one, as well, as part of Excerpts from Octopus. This entire session appears on TOTALLY OUT OF THE WOODS, but not on the earlier OUT OF THE WOODS album. By the fall of 1973, the band's live shows began to take on a more visual aspect with the use of projection screens placed behind the stage. At first, one screen was used but that evolved, by later tours, into the use of multiple screens. The group's popularity had been steadily rising for a while and they now found themselves headliners for many of their concerts in Europe. Before swinging through Europe, they were also able to headline a UK tour, supported by Wild Turkey, but their English concerts were not always as well received as the band would have liked. One visual idea they had planned on using at this time was a film of John Weathers, in Gentle Giant costume, walking slowly through a village seemingly made of doll houses, this miniature village located in Southsea, England. The film, shot by Ray Shulman with the help of a roadie, was intended to be projected onto smoke from a smoke machine, but the idea failed and was never used. The Runaway - The "breaking glass" tape loop at the beginning of this song, played amidst flashing strobe lights, served as an intro to the shows. Excerpts from Octopus - This new arrangement was to become their most famous medley. It combined portions of Knots and The Advent of Panurge and also included the recorder quartet, a Kerry Minnear organ bridge and an acoustic guitar duet. This duet, played by Gary and Ray, contained a theme taken from the song The Boys in the Band. Nothing at All - The percussion section began to include several toy glockenspiels on which were played a variation of the folk song Shortnin' Bread. These were played by John, Gary and Kerry. In a Glass House - This title song to the new album took over the encore slot and provided a vehicle for an extended Gary Green guitar solo. Only the heavier second half of the tune was performed. At the end, the "breaking glass" tape loop returned as an outro, gradually fading out. By now, the only songs remaining in their live set from the early days were Funny Ways, Nothing at All and Plain Truth. Gentle Giant was definitely gaining a reputation as a band not afraid to rearrange its own music in unusual, creative ways and to show off its ensemble skills when in a live setting. Yet, at the same time, the last three songs of the set were more loosely structured and gave breathing room for individual members to act as soloists. 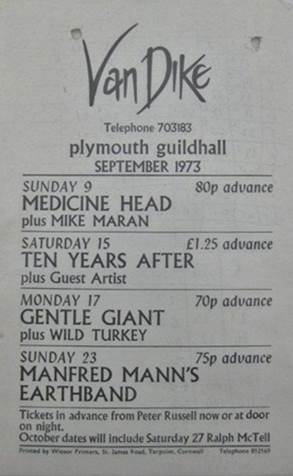 Sep. 17 Plymouth, England Guildhall Wild Turkey opened the show, with singer/guitarist Rod Crisp also on the bill. Starting with this tour, a new stage prop was added to the presentation. Suspended above and behind the band could be seen the word “GIANT”, hung in large, shimmering letters. A fan at the concert reports that at one point, a spotlight was shone on this sign from the back of the hall, reflecting countless shafts of light into the room. The effect was said to be quite magical. A tape exists of this first night of the tour, which includes the band’s very first performance of Excerpts from Octopus. During this medley, Kerry included a three and a half minute keyboard solo just before the band segued into The Advent of Panurge. The solo contained snippets and variations based on the songs Raconteur, Troubadour, Acquiring the Taste and even a small bit of A Cry For Everyone. This keyboard solo was apparently dropped right away, as it appears on no other known GG recording. However, much of this keyboard material was later infused into the medley’s acoustic guitar duet beginning in late 1975. The entire recording of Excerpts from Octopus has been included on the 2004 SCRAPING THE BARREL box set, with this keyboard solo portion entitled Keyboard Concerto. Sep. 19 Doncaster, England Top Rank Wild Turkey opened the show. Sep. 21 IN A GLASS HOUSE was heavily advertised to be released in England on this date, although some indications place the actual date one week earlier on Sep. 14. It was not originally released in America. Sep. 22 Manchester, England Stoneground Wild Turkey opened the show. Giant played this hall a number of times in their career and a fan at one of those concerts remembers a loud, annoying hum coming from the PA throughout the entire concert. It’s not known yet at which Manchester gig this happened. This hum is not evident on a tape that exists of this particular show. Sep. 23 Oxford, England New Theatre Wild Turkey opened the show and was reported to be well received. Rod Crisp appeared on this bill, as well. A review in Melody Maker stated the audience had some trouble warming up to material from the new album. Sep. 24 Chatham, England Central Hall Wild Turkey opened the show. At one point during this show, Derek threw his tambourine into the air, as he often did. However, on this night, it’s been reported that it hit Kerry on the way down. To his credit, Kerry continued to play. Sep. 26 Southampton, England Top Rank Suite Wild Turkey opened the show. Sep. 28 Birmingham, England Town Hall Wild Turkey opened the show, with Rod Crisp also sharing the stage. After the show, John Weathers noticed smoke in the balcony and the fire department was summoned. The press the next day credited him with saving the building. Sep. 28 Giant's seventh BBC session from Aug. 28 was broadcast on Sounds of the Seventies, hosted by Pete Drummond. It’s believed that a session by the group Sassafras was also broadcast, although Record Mirror had announced earlier that Mike Moran would be sharing the bill with Giant. In September, Record Mirror reported that Kerry Minnear had previously been contracted by the Cincinnati Symphony Orchestra to compose an original piece for performance at a music festival in that city in February 1974. Kerry was said to be hard at work on the piece, a 45 minute orchestral and choral composition which the band’s management said was to be recorded live at the festival. However, even if such a project was discussed at some point, Kerry himself has confirmed that no such piece was ever written or performed. Sep. 29 Glasgow, Scotland City Hall Wild Turkey opened the show. Sep. 30 Edinburgh, Scotland Caley Cinema Electrical limitations at the venue made it necessary for GG to forgo use of their own lighting effects, relying instead only on the house lights already in place. A fan who attended this show claims the band played for two hours, but this would be unusual and is not likely. The fan also claims the setlist included Think of Me With Kindness, a song not generally thought to be performed live. This is unconfirmed. Rod Crisp and Wild Turkey opened the show. Oct. 2 Leicester, England Polytechnic Wild Turkey opened the show. Oct. 3 Bristol, England Top Rank Wild Turkey opened the show. Oct. 4 Llanelli, Wales Glen Ballroom Wild Turkey opened the show. This gig was not on the band's original schedule, which called for them to be in Neath, Wales on this night and Aylesbury, England on Oct. 5. Both performances were pushed back one night. Oct. 5 Neath, Wales Gwyn Hall originally scheduled for Oct. 4 but changed to make room for the Llanelli concert. Wild Turkey opened the show. Oct. 6 Aylesbury, England Friar's Club originally scheduled for Oct. 5 but changed to make room for the re-scheduled Neath gig. Wild Turkey opened the show. The band next embarked on a European tour which was supposed to bring them to Italy, Switzerland, Germany and Belgium. The scheduled dates in Italy, as found below, were published in the Italian music magazine Ciao 2001 but, after leaving Italy, details are very sketchy as to exact dates, cities and venues of the remaining concerts. The German dates seem to have been drastically altered from what had been planned, while no confirmation at all has been found for the Swiss and Belgian dates. 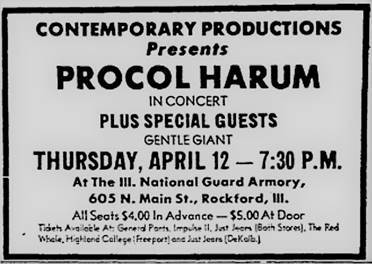 Originally, Giant was supposed to play seven consecutive German gigs opening for Procol Harum between Oct. 19 and Oct. 27. They ended up doing very few. There is also the possibility that the group may have even ended their European dates where they started, back in Italy. Early evidence suggests that Tir Na Nog was supposed to play support at the Italian shows, but Acqua Fragile took over the support slot. 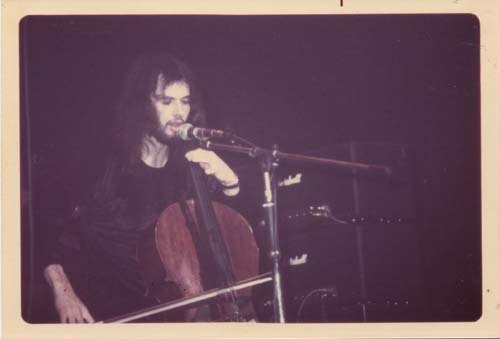 Around this time period, Acqua Fragile opened for a number of the British progressive groups but, according to their bass player, they considered Giant to be the finest, most talented band they had the pleasure to support. It seems that two sets may have played on days when performing in small theaters, while the larger halls hosted just one set. Oct. ? Padova, Italy It appears likely that, although not advertised on published tour schedules, a concert was added in Padova, possibly on a weekday. It was held in a local theatre, since demolished, and it’s been reported that the audience was a bit colder in response toward the newer material than they were toward OCTOPUS and earlier material. This gig was recorded by a female audience member, but the tape is presumed lost. Acqua Fragile may have opened at this show, as they did for the rest of this Italian tour, but one fan in attendance says there may not have been any opener. Oct. 9 Catania, Italy Teatro Ambasciatori There were two shows on this date in a theater that was small and cramped. Italian progressive band Acqua Fragile opened the shows on this and all the remaining Italian dates of this tour. 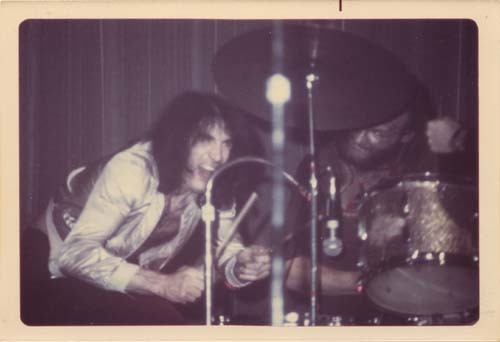 In a 1975 interview, Derek boasted about the fact that Giant had once been able to play a date in Sicily, implying it to be a rare occurrence. Actually, the band played at least twice in Sicily, the two known dates being this one and the next night in Palermo. Oct. 10 Palermo, Italy Teatro Biondo There were again two shows with Acqua Fragile opening both. There had been some evidence that the band actually played in Frankfurt, Germany on this date, but the Palermo show has since been confirmed. Oct. 12 Bari, Italy Teatro Petruzzelli Acqua Fragile opened the show. During the afternoon soundcheck, that band ran through the GG song Giant. They believed they were alone but were surprised when, at the end, GG band members started applauding from backstage. Oct. 13 Rome, Italy Palazzo dello Sport Acqua Fragile opened the show. A tape of this concert once existed, but its whereabouts are now unclear. Oct. 15 Reggio Emilia, Italy Palazzo dello Sport Acqua Fragile opened the show. Oct. 17 Treviso, Italy Teatro Garabaldi There were two shows and a tape exists of one of them, but it’s not known which. At the recorded show, during the guitar solo to In a Glass House, Gary threw in a brief theme from Peel the Paint. Acqua Fragile opened both sets. Oct. 18 Milan, Italy Palalido Acqua Fragile probably opened this show, but it’s not certain. Oct. 19 Torino, Italy Palazzo dello Sport Acqua Fragile opened before an audience of over 5,000. A soundboard recording of this show, originally owned by a band member, has been officially released on the 2001 Glass House CD IN A PALASPORT HOUSE and again, in mp3 form, on the band's SCRAPING THE BARREL box set. A roadie at the show incorrectly remembers this recording as being made in January 1974, but GG did not play in Italy at that time. Oct. 20 Genova, Italy Teatro Alcione Two shows were played on this date, in the afternoon and evening, both of them before sold out capacity crowds of 1,500. Yet another tape exists, possibly of the afternoon show, this one showing that Gary again played the Peel the Paint theme during his guitar solo. Before Plain Truth, Derek thanks the crowd while giving a polite mention to the city’s two football clubs, Genoa and Sampdoria. Acqua Fragile opened both shows. Oct. 21 Travagliato, Italy Supertivoli A tape exists of this show, as well. Acqua Fragile opened. The sound at the venue was said to be poor, by one report. A press review cited the band’s performance as “magnificent” while complaining about traffic and local government restrictions adversely affecting the event. Oct. ? Genova, Italy Teatro Alcione Things become very confusing over the next few days. There is an unconfirmed report that, after selling out their two Genova shows on October 20, the band agreed to play one more night there. This third Genova show was some unusual, special performance with a report of as few as 20 or 30 people in the audience, even though the venue held 1,500. While introducing the band, an announcer described the show as being some sort of family style performance, although the exact meaning of that is unclear. It is not certain on which night this may have occurred, but the best information so far indicates Oct. 22 to be the most likely date. Therefore, for this to be true, there would have had to have been some cancellations or shuffling in the following few scheduled Italian or Swiss dates, but exactly what transpired is unknown. It’s believed that, if this third Genova concert did take place, there was no support act. Oct. 22 Novara, Italy Pallazzo dello Sport Acqua Fragile was scheduled to open for GG on this date in Novara. However, very little written documentation of this has been found and Oct. 22 also seems to be the most likely date for the third Genova concert listed above. For this to be true, this Novara date would have had to have been canceled or rescheduled somehow. Record Mirror also advertised a Basel, Switzerland gig on Oct. 22, but that seems more likely for the following night, as listed below. Oct. 23 Basel, Switzerland Festsaal Mustermesse The band did intend to play a concert in Switzerland on this date and one fan report has them headlining at this Basel venue with an unknown local keyboard/synthesizer player opening. Amazingly, however, Record Mirror advertised Oct. 23 as the scheduled date for GG’s very first concert behind the iron curtain, in Belgrade, Yugoslavia. This almost certainly did not take place, nor did a couple dates in Russia the group was trying to book for late October. Oct. 24 Switzerland City and venue are unknown. Oct. 25 Germany This may have been the first scheduled German date of GG’s European tour, but it is not confirmed. The exact city on this night is unknown, as well, although it could have been Dortmund or Heidelberg, as mentioned below. Oct. 26 Berlin, Germany Deutschland Halle Folk guitarist Leo Kottke went first, then Giant, both opening for Procol Harum. Oct. 27 Hamburg, Germany Congress Centrum Procol Harum headlined this show also. A local Hamburg musician named Vince Weber played first, followed by Leo Kottke. Giant was third to play, right before the headliners. Oddly, these four acts were originally scheduled into two separate concerts, both on earlier dates, but low ticket sales led to all the performers being combined into this one bill on Oct. 27. Oct. 29 Frankfurt, Germany Jahrhunderthalle Giant may have played without an opening act at this gig, for which a tape exists. An earlier report that this gig was moved up earlier in the month to Oct. 10 is untrue. Oct. ? Dortmund, Germany Market Hall The exact date of this concert is not known although, as stated above, it would have been sometime between Oct. 25 and Oct. 31. Giant had no support act for this gig. The small venue literally served as a marketplace, described by an attendee as a place “where in the morning, pigs might have been sold”. He said it still smelled that way in the evening. Oct. ? Heidelberg, Germany There are indications the group played in Heidelberg sometime in 1973. It could have been either during this tour or earlier in June or July when they did a few German festival dates. A live tape of this Heidelberg show was even rumored to exist. Oct. 31 Germany This may possibly have been the final scheduled German date of the tour. The city is unknown although, again, it could have been Dortmund or Heidelberg. Nov. 1 Belgium The first Belgian show was originally scheduled for this date. Nov. 4 Belgium If the original itinerary was adhered to, the final date of the European tour was held on this date, again somewhere in Belgium. Nov. 16 The BBC recorded a short live set in Golder's Green, England at the Golder's Green Hippodrome. The band performed Way of Life, Funny Ways, Nothing at All and Excerpts from Octopus and the show is included on the 1998 OUT OF THE FIRE album. Folk guitarist Dave Ellis preceded Giant on the bill. It is interesting to note that, for some unknown reason, a small section of The Advent of Panurge from Excerpts from Octopus was edited out of the original broadcast and did not appear on the official CD either. However, it did surface on an American Rock Around the World broadcast on July 20, 1975. Dec. 4 At London's Langham Studio 1, the band did their eighth BBC studio session, broadcast on Jan. 8, 1974. This entire session, consisting of Excerpts from Octopus and Way of Life, appears on the OUT OF THE WOODS and TOTALLY OUT OF THE WOODS albums. Dec. 8 The BBC broadcast the Nov. 16 Hippodrome show on its In Concert radio show, narrated by Mike Harding. Guitarist Dave Ellis also performed on the program. 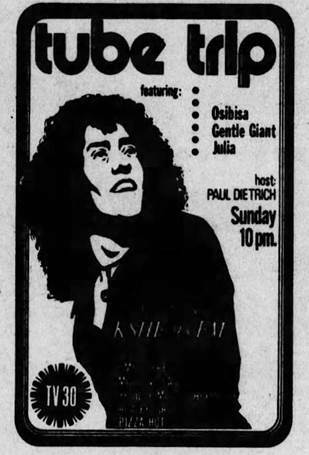 A portion of Giant’s concert was also included on the Rock Around the World broadcast in the U.S. on July 20, 1975. Dec. 1973 - Jan. 1974 GG's sixth album, THE POWER AND THE GLORY, was recorded at London's Advision Studios. It's a concept album about the abuse of political power, an idea which, according to John, was first proposed by Phil while he was still in the band. Interestingly, it was recorded during America's devastating Watergate scandal, but the band has claimed this was merely coincidence. Although the recording sessions were basically completed at this time, there is evidence the band may have done some studio touchups in June 1974. In a late 1974 radio interview, Derek said that it took six months from the time writing for the album began to the time recording was completed. Work in the studio proved to be difficult. England was experiencing a power crisis at the time and the band usually worked on a cycle of two days on and three days off. The temperature in the studio was kept on the chilly side, causing Derek to joke about how cold his fingers would get. 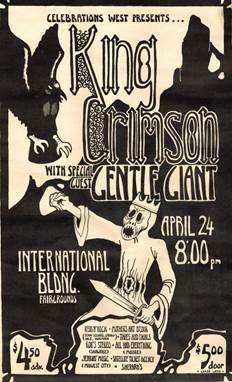 In addition to the unverified rumors of more dates with Jethro Tull, there are a number of other fan recollections of Giant playing with other bands in North America in late 1973 or early 1974. These include supposed gigs in Long Beach, Santa Barbara, Santa Monica, Chicago, Minneapolis and Toronto. There is no hard evidence to confirm any of these shows. Record Mirror, New Musical Express and Sounds had all announced a U.S. tour commencing in Boston on Nov. 9 and running until Dec. 23, but this tour was canceled. It is currently a safe assumption that Giant spent no time whatsoever in North America between May, 1973 and October, 1974. Ray later said that their record label’s refusal to release their new album in America was a big contributing factor to this situation. He also blamed the band’s manager, calling him a “crook”. Jan. 8 The band's eighth BBC session from Dec. 4, 1973 was broadcast on Sounds of the Seventies, hosted by John Peel. New Musical Express and Record Mirror had early on announced a second try at a tour of America, this time starting in Memphis, Tennessee on Jan. 27 and running for five weeks, but this tour was also canceled, like the one the previous November and December. 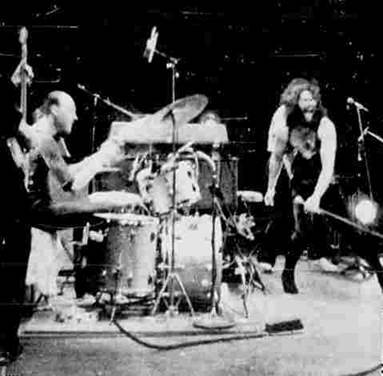 In March of 1974, Gentle Giant did hit the road again, staging another tour of Great Britain, supported by String Driven Thing. They followed this with another swing through Europe with String Driven Thing still in tow as support. Unfortunately, the band continued to feel that they were not always well accepted in their homeland, compared to the rest of the world, even though Derek claimed a few months later that this UK tour was sold out. The Runaway/Experience - These two songs were combined by use a of a prerecorded keyboard bridge. The Runaway was shortened, due to Kerry's discomfort with singing in a live setting. Prologue - This song made a brief return to the setlist. Mar. 8 Chatham, England Central Hall It had been advertised that the UK tour was to begin on March 4 but it apparently was pushed back to March 8. String Driven Thing opened at this show. Ray claims to have had his Hagstrom guitar stolen at this venue, though exactly when is not clear. Mar. 9 Norwich, England University of East Anglia - Main Hall Giant played at this University several times and a fan who attended all of them clearly recalls one from the early 1970’s at which a student film crew of at least two cameras in different locations was present. It’s not known whether it was this gig or a different one, nor is it known if the University actually possesses the film in its vast archives. These archives still contain many unmarked films from this time period so, if a film of one of the band’s gigs is indeed there, it may still turn up in the future. This same fan was also fortunate enough to be present for another interesting scene at one of these University of East Anglia gigs. In the dressing room, he witnessed Derek, Ray and Gary jamming to a blues version of a song from an English soap opera called Coronation Street. Again, it’s not certain at which Norwich gig this took place. String Driven Thing was not scheduled to play at this particular gig, the opening act instead being Flying Hat Band. It's possible this show was originally scheduled for Mar. 7, at which time String Driven Thing may very well have been intended as support. Mar. 11 Manchester, England Free Trade Hall String Driven Thing opened. Mar. 13 Guildford, England Civic Hall String Driven Thing opened. This was a late addition to the tour schedule. After opening the show, the members of String Driven Thing were spotted in the balcony watching Giant’s set. At the time, some sort of glittery ball hung over the stage, serving as one of GG’s stage props After this show, an acquaintance of Giant’s revealed to an audience member that the band did not like the ball and used to “kick it around”, hoping to break it. Mar. 14 Plymouth, England Guildhall String Driven Thing opened. A tape exists from this show. During Gary’s In a Glass House guitar solo, he gives a nod to Cream by playing a fragment of Spoonful. Mar. 15 Swansea, Wales Guildhall - Brangwyn Hall String Driven Thing opened. Brangwyn Hall is actually one of the rooms inside the larger Guildhall. Mar. 16 London, England Drury Lane - Theatre Royal was originally scheduled for Mar. 10. String Driven Thing again opened. A professional film crew filmed a portion of Giant's set on this night. New Musical Express stated that the film crew was from Germany and that they were filming as part of a planned TV documentary. Some of this footage was shown on German television on April 26, 1974 and possibly again on June 28, 1974. A small portion of this German broadcast now appears, in color, on the official 2004 DVD release, GIANT ON THE BOX. 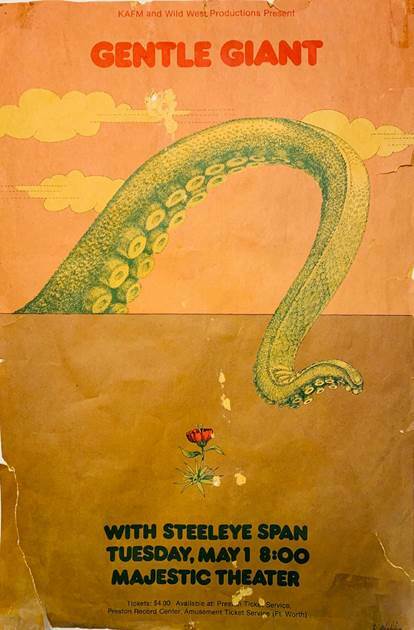 Excerpts from Octopus taken from this film was also broadcast on Italian TV on June 2, 1976. This Italian broadcast, shown in black and white, also appears on GIANT ON THE BOX. Additionally, the last few minutes of the same medley were broadcast, again in color, on the BBC Old Grey Whistle Test television program on Nov. 26, 1974 and this now appears, in both audio and video format, on the 2006 GG AT THE GG DVD. New Musical Express also claimed that "several surprises" were planned for the Mar. 16 concert, specifically mentioning a 7’4” giant being used to greet concertgoers in the lobby. To corroborate, Kerry and John also recall the band inviting one of the tallest men in England to attend the show at Drury Lane. Reviewers writing in both Sounds and Melody Maker made special mention of the silver “GIANT” sign lighting up over the stage during the “breaking glass” tape loop, both before the opening number and after the encore. In a Sounds interview given and published in March, during this UK tour, Derek again brought up Kerry’s alleged commission to compose some music for the Cincinnati Symphony Orchestra, as had earlier been reported back in Sep. 1973. Kerry has confirmed that no such music was ever composed, but how such a rumor circulated in the first place is still unclear, as is the fact that the story changed as it went along. Originally, the live premiere of Kerry’s original piece was to have taken place in February, but now Derek claimed it was actually an orchestration of one piece from ACQUIRING THE TASTE and it was to be performed soon during an American Midwest tour. Mar. 18 Birmingham, England Town Hall String Driven Thing opened. Mar. 19 Watford, England Town Hall A tape exists of this concert for which String Driven Thing opened. There were no seats in the hall, so all in attendance had to stand. The acoustics were also far from ideal. Mar. 20 Bedworth, England Civic Hall This concert was not originally on the band’s itinerary, but has been confirmed by both a fan recollection and records provided by the Civic Hall itself, a small town venue that rarely staged concerts by name rock bands. This particular event was billed as a “pop dance” and included String Driven Thing as support and a disco dance preceding the evening’s live music. Wryly commenting on the band’s struggles for acceptance in England, Derek introduced Excerpts From Octopus as a “massive hit on both sides of the Atlantic, except here in the UK”. A tape of this show is rumored to exist. Mar. 21 Derby, England King's Hall String Driven Thing opened. Mar. 22 Sutton in Ashfield, England Golden Diamond This concert was originally scheduled for Mar. 24, but ads printed closer to the event listed the date as Mar. 22. String Driven Thing may not have opened as their own publicized itinerary did not include this gig. Mar. 29 Bournemouth, England Winter Gardens String Driven Thing opened. Apr. 4 Frankfurt, Germany Jahrhunderthalle String Driven Thing opened. Apr. 5 Munster, Germany Munsterlandhalle String Driven Thing opened. Two distinct recordings, taped by different people in the crowd, exist of this show. The first recording appears, in its entirety, on the PROLOGUE CD on the Glass House label. The song In a Glass House from this first recording has also been released officially as a bonus track on a 2000 CD reissue of the IN A GLASS HOUSE album. A few minutes of The Runaway, Experience and Funny Ways from the second recording are included in the GG AT THE GG DVD, where they are synchronized with several minutes of private 8mm film from this same show, filmed by yet another member of the audience. Apr. 6 Stuttgart, Germany Gustav-Siegle-Haus On this evening, Alan Knight, a gentleman who roadied for GG in the spring of 1974, took over 30 photos of the band, but his camera was unfortunately stolen. The road crew had their hands full during the show as the hydraulics controlling GG’s left loudspeaker stand were not functioning, causing the stand to continually slip down. String Driven Thing probably opened but their presence on the bill has not been verified. Apr. 7 Kehl, Germany Stadthalle String Driven Thing opened. Apr. 8 St. Gallen, Switzerland Kongresshaus Schutzengarten String Driven Thing opened. The German version of Sounds magazine advertised the venue as Volkshaus Burgvogtei but that is probably untrue. A tape of this gig exists, as well. Apr. 9 Munich, Germany Theater an der Brienner Strasse String Driven Thing opened. Apr. 10 Hamburg, Germany Musikhalle A ticket stub from this show announced the bill simply as "Gentle Giant and Guests". However, it has been confirmed that String Driven Thing did indeed open. Originally, the band had set their mind on yet another try at an American tour after the initial European dates, starting in mid April somewhere in Florida and running for four weeks. This was to be their third attempt but, again, it did not work out. Instead, after playing in Germany, GG scheduled a significant number of dates in France. 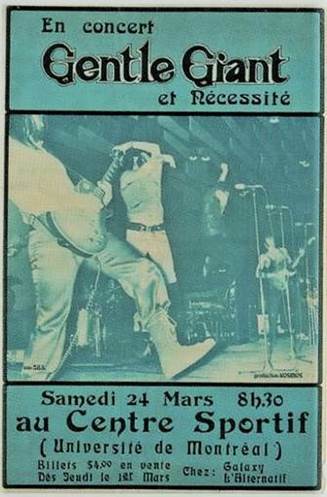 This French tour was advertised in the French music press at the time and is the only known time the band ever planned an extensive stay in that country but, other than a passing reference in Sounds magazine, no other corroboration has come to light, so it’s difficult to ascertain if the tour even took place. Giant never earned extensive press coverage in France and did not have the same impact there early on that they enjoyed in some other European nations. Somewhere around this time, they also intended another swing into Italy to play some dates there. However, there was much political upheaval and rioting in Italy at the time. 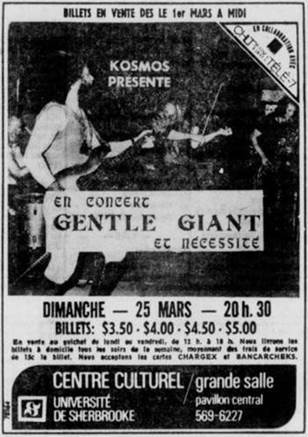 Rock concerts by non-Italian bands were not common, Gentle Giant being one of the few bands able to play there with any regularity. Authorities in that country viewed Gentle Giant as performers of “serious music”, not simply as a rock band. Still, the group abandoned their 1974 plans there. It’s possible they went ahead with a small number of concerts, but they very well may have canceled all appearances. One fan seems to remember an April show in Rome, but it is not confirmed. A rumor of GG being filmed in April for Italian television is also unconfirmed. Apr. 26 The German TV network Bayrischer Rundfunk broadcast some footage from Giant's spring 1974 tour on a program called Szene 74, the footage being from the band's London gig of Mar. 16. A small portion of this has been included in the official DVD, GIANT ON THE BOX. Seen on the DVD is the guitar and drums ending portion of the song In a Glass House. Film of Renaissance was shown on the same broadcast, the theme of which was “Youth and Sexuality”. May 5 Breda, Holland Turfschip GG headlined this one day festival, sharing the stage with several other acts, including Kayak and Dizzy Man’s Band. A fan recalls the band jumping off the ground just before the opening lights came on, giving the impression of the band "falling from the sky" to start the show. It's unknown whether this was a regularly used gimmick. Another fan in the crowd recorded Giant’s set, but the tape is now believed to be lost. Kerry admits to having fond memories of the times the band played in Holland through the years. May ? An article in Sounds stated that the band was to do six college gigs in England in early May. No details are known. Once again, evidence indicates that the band unsuccessfully attempted to schedule an American tour, this time beginning on either May 14 or May 18. According to Melody Maker, it was to last until the end of June, while Sounds reported that it was to be an eight-week tour. Either way, keeping the band's losing streak going, it was canceled, like all the previous attempts. May 29 The band recorded So Sincere, Aspirations, Playing the Game, and The Face, all songs from their new album, at their ninth BBC studio session in London. The studio used for the recording, broadcast on July 1, is not known. The entire session is missing. June ? It’s likely that this is when Giant booked a little more time in a studio, most likely in London, to record their only non-LP single, a song called Power and the Glory. It was released in the UK, probably in early October. Ray said in 1975 that the band actually recorded three songs in an attempt to come up with a single and he joked that they "released the worst one". More recently, Kerry has also confirmed that three songs were written. However, it's possible that they may not have all been recorded. On the other hand, the SCRAPING THE BARREL box set does include a few outtakes from around this time period that theoretically could have been part of this search for a single. June 11 Toledo, Ohio Agora did not take place. 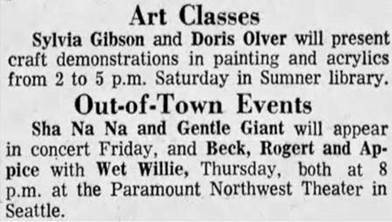 This is the only specific date that has been identified so far from the aborted May - June U.S. tour, as evidenced by a newspaper advertisement. 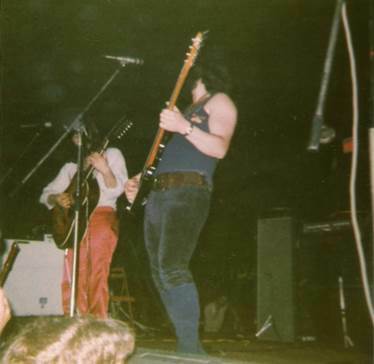 June 15 Sheffield, England Sheffield University - Student Union This was a one-off concert, between regular tours, although a longer UK tour was at one time considered for the month of June. The stage was very small, creating a very intimate setting. June 28 It's believed that the German TV network Bayrischer Rundfunk once again broadcast footage from Giant's spring 1974 tour on the program Szene 74, filmed at the band's London gig of Mar. 16. This time, about 45 minutes of music was shown. The network had already broadcast at least some of this footage on Apr. 26. July 1 Giant's ninth BBC session from May 29 was broadcast on Sounds of the Seventies, hosted by Bob Harris. Sep. 6 Penzance, England The Garden A poster exists advertising a Sep. 6 show in this modestly sized town at the southwestern tip of England. The poster mentions no other act on the bill. The authenticity of this poster is still in question, as no other information is known as to shows the group may have played during this time period, either in England or elsewhere. Sep. 22 THE POWER AND THE GLORY album was released in America sometime in September, with Sep. 22 being a good possibility. Oct. ? The non-LP single, Power and the Glory, may have been released in England during the first week of October, apparently around the same time as the new album. An ad in Sounds indicated that the single came out first, although it may have been just a matter of days. Specifics on where and when the single was recorded are also unclear, though it was probably in London in June. Eventually, Power and the Glory was also included on the 1975 compilation album, GIANT STEPS, as well as being added as a bonus track on a later CD reissue of their THE POWER AND THE GLORY album. It was never released as a single in America. Oct. 4 Pinning down exactly when THE POWER AND THE GLORY was released in England has proven very difficult. Back in February 1974, New Musical Express announced the album would be out in May, but this certainly did not happen. Next, a number of UK press reports pointed to a date of June 21. Later still, this date of October 4 popped up in the press, making the June date unreliable. However, regardless of exactly what transpired, British copies of the album had certainly appeared in the marketplace, either officially or unofficially, as early as late June. ??? There are reports that the group appeared on a Portuguese television program sometime in 1974, but this is totally unconfirmed.